LUCENT LINES SERIES NO. 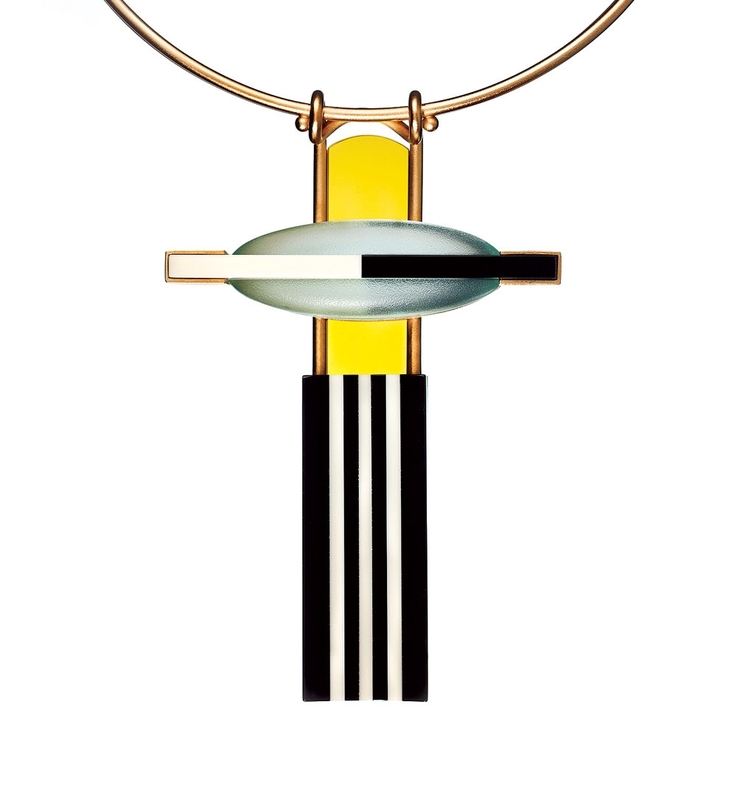 09 NECKLACE of polished clear and neodymium glass, fourteen karat yellow gold-tubing, twenty-four karat yellow gold plated, 17.8 centimeters diameter, 1994. Photographs by Bill Truslow except where noted. Monumentality in art, as André Malraux famously implied through his concept of the musée imaginaire, is an effect of form that, despite its associations with strength, imperviousness to change and dominance over surrounding space, is not necessarily dependent upon the actual size of an object. The effect of monumentality produced by a given artwork can arise in the mind of the viewer entirely through comparison of the features of that work with the formal characteristics of others in the dimensionless space of memory—or, more mundanely, through comparison of such formal characteristics in the printed or digital-media images through which we experience the vast majority of art today. To describe the brooches and necklaces of New Hampshire artist Linda MacNeil as monumental, therefore, is to classify their visual effects with those of Egyptian obelisks, the Chrysler Building’s mammoth steel gargoyles, or the towering Guardians of Traffic on Cleveland’s Hope Memorial Bridge without ever denying their physical compatibility with the intimacy of the body. The monumentality of MacNeil’s work, in other words, arises from associations with a certain kind of art that is often colossal but ultimately not restricted to any absolute scale in relation to the human form. NECK COLLAR SERIES NO. 28. AJDC Theme Project “Stripes” of acid polished clear mirrored glass, polished ivory and black Vitrolite glass, chrome plate, 21.0 x 14.0 x 1.3 centimeters, 2017. Photograph by Robert Weldon. BROOCH SERIES NO. 34 of polished cream and black Vitrolite, acid polished mirrored clear glass, rubies, polished fourteen karat white gold, 7.0 x 1.3 x 1.3 centimeters, 2005. NECK COLLAR SERIES NO. 26 of acid polished blue transparent and clear mirrored glass, ivory and black acid polished Vitrolite glass, twenty-four karat gold plated, 21.3 x 15.2 x 1.9 centimeters, 2017. DOUBLE DECO, BROOCH SERIES NO. 47 of acid polished light brown and clear glass, acid polished and polished black and cream Vitrolite, white diamonds, polished fourteen karat white gold, 7.6 x 7.0 x 1.0 centimeters, 2009. MIRRORED, BROOCH SERIES NO. 91 of polished clear, chartreuse mirrored glass, yellow Vitrolite glass, linear striped surface detail, rhodium plated fourteen karat white gold, white diamond, 7.6 x 6.4 x 1.3 centimeters, 2015. Elements SERIES NO. 40 NECKPIECE of polished multicolored mirror and acid polished clear glass, diamond details, fourteen karat yellow gold, 16.5 centimeters diameter, 2005. Regardless of its particular inspiration, each of MacNeil’s works tends to be a one-of-a-kind piece but with the notable familial traits that arise from seriality. “By working through series,” she explains,” I am developing a concept in a repeated way. I often have many ideas for the way it can go, so each piece in the series is a new version of the original concept.” That concept, both a unifying idea and a descriptor of traits that link individual works to one another, ultimately provides the name for the series. The Elements series, for example, “refers to distinct repeated forms within a necklace, usually emphasizing the mechanical connections and making them a feature in the design. 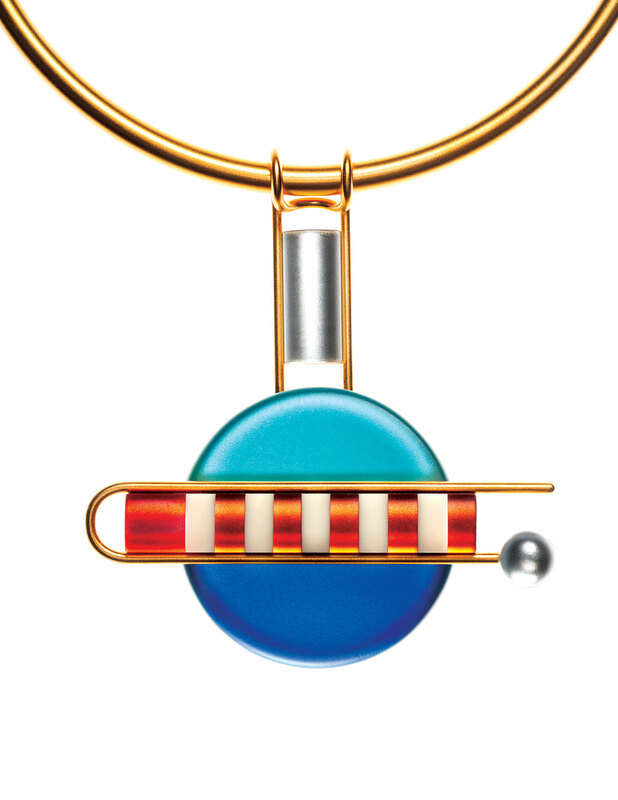 This sets off the individual ‘elements’ as they are presented by the structure of the necklace.” Incorporating cut, shaped and drilled plate glass, gold-tubing and sheet stock, the necklaces of this series have since the 1980s provided MacNeil with the opportunity to nudge the often rigid character of geometry toward “a free-flowing orbit of elements.” Geometry, particularly as it defines the bright, flat planes of primary and secondary colors in De Stijl design, has always appealed to MacNeil, but her Elements series seems to arise from the kind of musing in which Alexander Calder indulged when he visited Mondrian’s studio and thought, “how fine it would be if everything there moved.” The quality of motion in the necklaces is not only literal—as a wearer’s movements cause the elements to pivot like links in a chain—but metaphorical as well: elements that repeat, but in different colors, or two different kinds of elements that alternate around the necklace create rhythmic implied motion. LUCENT LINES SERIES NO. 20 NECKLACE of polished clear optical, black and cream Vitrolite glass, ruby details, fourteen karat yellow gold, 16.5 centimeters diameter, 2004. Closely related to the Elements series, the works of the Lucent Lines series display a similar structural logic of elements dispersed in repetition around circular neckpieces. The series title refers to the opaque parallel lines resulting from holes drilled through the glass elements, some merely for visual effect and some as conduits for gold-tube connectors but all of them “punctuating the pure clarity of the geometric form.” Each of the elements—composed of commercially manufactured plate glass, lead crystal or colored transparent glass—is carefully cut, shaped and drilled to identical specifications then either acid-finished for a satiny texture or polished to a high luster. The elements of the Lucent Lines series often channel the bold monumentality of Art Deco architectural or decorative art designs. Necklace, Lucent Lines Series no. 20, 2004, for example, vaguely recalls the mechanical fluting and sleek industrial associations of massive Art Deco cornices on portals of skyscrapers, while Necklace, Lucent Lines Series, no. 09, 1994 conveys the impression of pink-stoppered Lalique perfume bottles strung like faceted beads on gold-tubing. MESH SERIES NO. 119 NECKLACE of polished red, purple and yellow Vitrolite glass, polished black and cream Vitrolite glass, gold plated, 6.4 x 5.7 x 1.9 centimeters, 2009. MESH SERIES NO. 145 NECKLACE of acid polished cast mirrored glass, polished Vitrolite glass, twenty-four karat gold plated, 9.5 x 5.7 x 1.6 centimeters, 2017. A similar monumentality of form characterizes the pendants of the Mesh series, which evolved from aspects of the Elements and Lucent Lines necklaces in the mid 1990s and is still proving a rich source of possibilities for exploration today. MacNeil describes the introduction of the series as liberating because she no longer felt “bound to such a labor-intensive, complicated task as I had in the Elements series” and because it helped in dispensing with “the notion that the use of commercial chain was inappropriate for my work.” Each of the unique glass and metal pendants hangs upon a flexible mesh tube capped at the ends by a catch. “The wearability is extremely important to the owners of my necklaces,” MacNeil notes, but the arrangement of a pendant on a simple mesh chain has also allowed for development of a broad range of concepts not possible in the Elements series format. NECK COLLAR SERIES NO. 19 of blue mirror laminated glass, polished cream, black, red, and yellow Vitrolite glass, polished, mirrored cabochons, gold plated, 15.9 centimeters, pendant 14.0 x 3.2 x 1.3 centimeters, 2010. NECK COLLAR SERIES NO. 24 of acid polished blues, orange and clear mirrored transparent/orange ivory Vitrolite, twenty-four karat gold plated brass, 22.9 x 14.3 x 2.2 centimeters, 2016. NECK COLLAR SERIES NO. 18 of acid polished clear glass, mirror laminated yellow glass, polished cream and black Vitrolite glass, gold plated, 15.9 centimeters diameter, pendant 14.0 x 8.9 x 1.9 centimeters, 2010. BOUQUET EDITION, FLORAL SERIES NO. 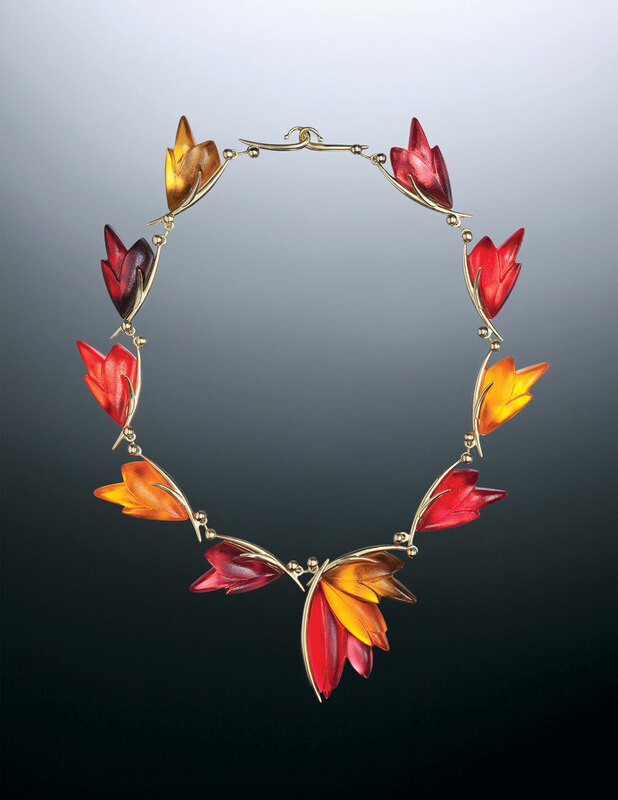 84 NECKLACE of acid polished red, orange, amber, pink, maroon transparent glass, laminated to mirrored glass, polished eighteen karat yellow gold, 20.3 centimeters diameter, 2009. BOUQUET EDITION, FLORAL SERIES NO. 85 NECKLACE of acid polished transparent shades of blue, and clear glass laminated to mirrored glass, polished eighteen karat gold, 15.2 centimeters diameter, 2009. PRIMAVERA NECKLACE, FLORAL SERIES NO. 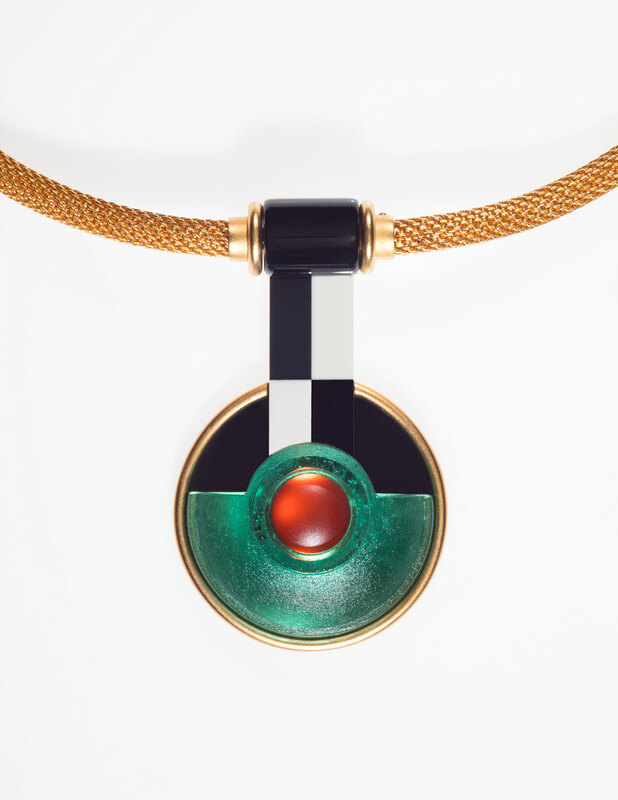 98 of acid polished, light yellow, green, red, mirrored glass, eighteen karat yellow gold, white diamond detail, 15.2 centimeters diameter, pendant 7.6 x 2.5 x 1.3 centimeters, 2015. While monumental forms in MacNeil’s work can frequently be linked to inspiration in architectural elements or decorative art, the influence of nature has also exerted a significant impact. “A pod or a flower in full bloom is an irresistible beginning for a jewelry design,” she says. “Nature has already mastered the mechanics. My challenge is to interpret that plant life and to make a piece of jewelry. What is so interesting to me is that plant life can be extremely complex and feminine and also simple and quite masculine.” This compatibility of complexity and simplicity is reflected in Primavera Necklace, Floral Series no. 98, 2015, in which green-glass leaves and discrete white blossoms recall the monumental forms of Lalique’s Art Deco period while the looped tendrils and tiny faceted inset gems invoke his intricate and organically graceful Art Nouveau designs. Taragin, Davira S. and Ursula Ilse-Neuman. Linda MacNeil: Jewels of Glass. Tacoma, WA and Stuttgart: Museum of Glass and Arnoldsche Art Publishers, 2017. Arial, Kate Dobbs. 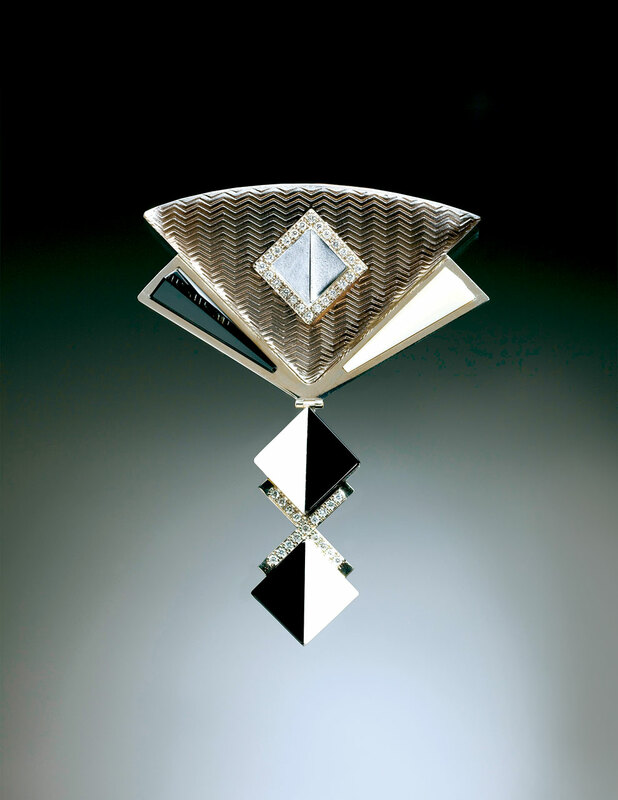 “Sculptural Radiance: The Jewelry and Objects of Linda MacNeil.” Metalsmith: 24:3, Summer 2004. Byrd, Joan Falconer. “Linda MacNeil: Mint Museum of Craft + Design, Charlotte, NC.” American Craft: 64:1, Feb/March 2004. 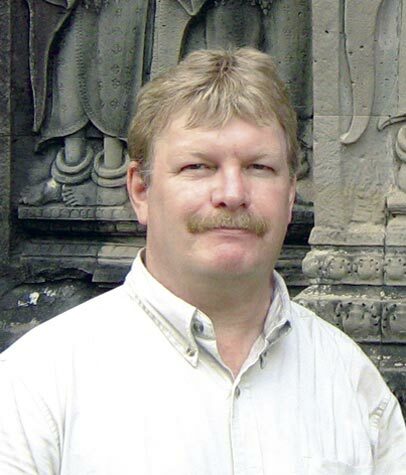 Glen R. Brown, a professor of art history at Kansas State University and a specialist on contemporary and historical craft media, takes particular note of jewelry that elevates ordinarily nonprecious materials to functional and aesthetic equivalency with gold or gems. He found in the necklaces of Linda MacNeil an especially interesting use of glass, not for its fragile translucence but rather for the strength and even monumentality that it can convey when cast or worked into simple geometric forms. MacNeil’s inspiration in Art Deco design also appealed to him. 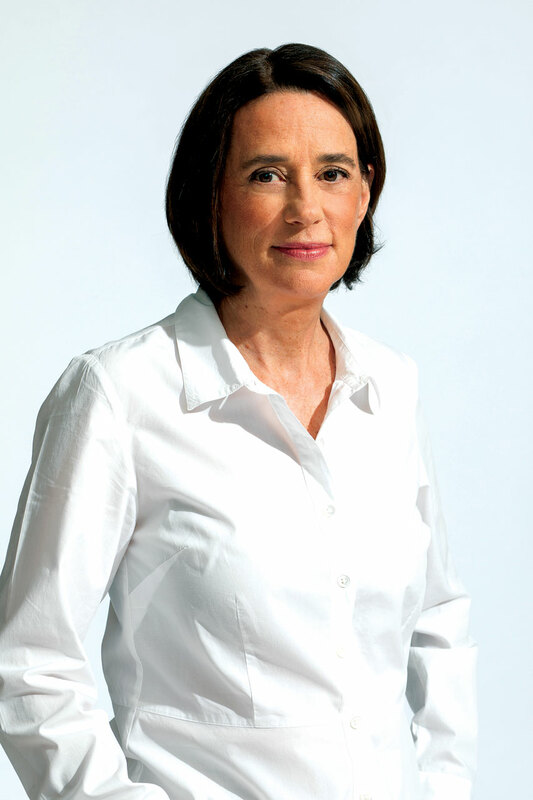 Brown is currently completing a book on the aesthetics of ceramic sculptor, painter and glass artist Jun Kaneko. VIRTUALLY INTACT FAIENCE BROADCOLLAR OF WAH, an estate manager, XIth Dynasty, circa 2020 B.C., 39.4 cm deep. X-ray in 1940 revealed this almost intact broadcollar within his mummy wrappings. It is the best preserved example of its type and is strung on linen threads without disk beads, with the typical fringe of drop pendants and semi-circular terminals. The first row has 83 cylindrical faience beads, the last 222 beads, increasing gradually in length from top to bottom, hinting at how many beads are required for this broadcollar. Ceramic artist Carol Strick has made a replica of this necklace. Courtesy of the Metropolitan Museum of Art, Rogers Fund/E. S. Harkness Gift, 1940, 40.3.2; gallery 105. Photographed as displayed, with high ISO and manual mode on a Canon SLR. Photographs by Robert K. Liu/Ornament unless noted. No other ancient culture has been as well-studied as that of Predynastic and Dynastic Egypt, especially the personal adornment of their upper class women and men. Well-developed technologies of working stone, metal, faience, glass, and fibers, all under the control of dynastic elites, contributed to a precision and uniformity of jewelry and dress. Living in a hot, dry climate, men wore linen kilts, women thin, tight sheath dresses of the same fiber, some pleated, and often with straps that covered the breasts. For health and comfort, both sexes usually shaved their heads, using wigs to prevent sunstroke (Watterson 1991). Depictions of ancient Egyptians on paintings, reliefs and statuary invariably showed them wearing broadcollars, almost an essential form of dress. The majority of broadcollars were made of cylindrical and/or disk beads of faience, a self-glazing, thixotropic ceramic that was both a luxury and a magical product for the elite (Friedman 1998). Robert K. Liu is Coeditor of Ornament and for many years its in-house photographer. His recent book, The Photography of Personal Adornment, covers forty plus years of shooting jewelry, clothing and events related to wearable art, both in and out of the Ornament studio. Recently he has been teaching one-on-one photography lessons at our office, as well as teaching workshops on bamboo jewelry. 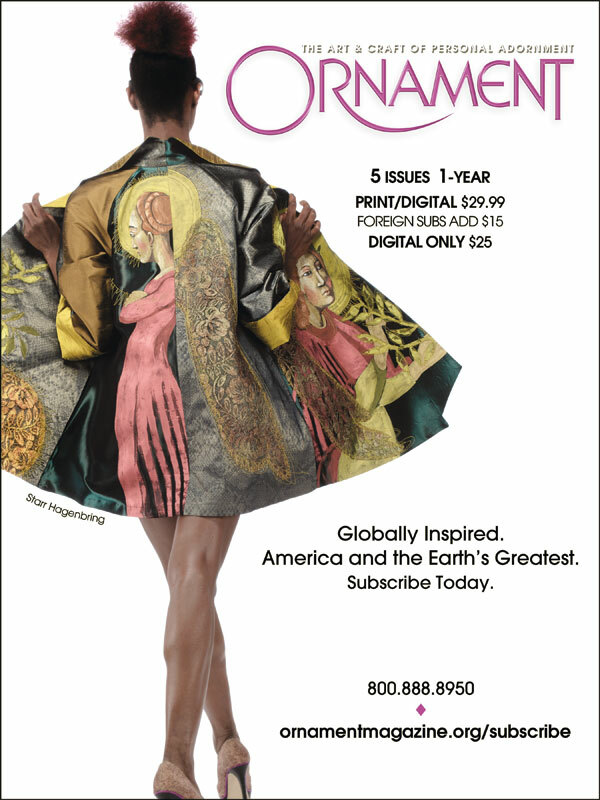 In this issue Liu writes about ancient Egyptian broadcollars, usually made of faience beads, how they were made and extant examples of this beautiful item of dress, including modern replicas by artist Carol Strick.